A friend of mine told me that McDonald’s attempt at Buffalo wings were good if you really need a fix of hot wings. I immediately scoffed. They’re called Mighty Wings, in an obvious effort to overcompensate for the lack of originality in the product itself. When I first saw the signage outside a corner Mickey D’s advertising them, I assumed they would be some kind of enlarged nugget served with hot sauce. BUT IT TURNS OUT – Mighty Wings are, in fact, real bone-in chicken wings. To my surprise, the wings are real, they’re fried, and you’ve got a selection of sauces to eat them with. 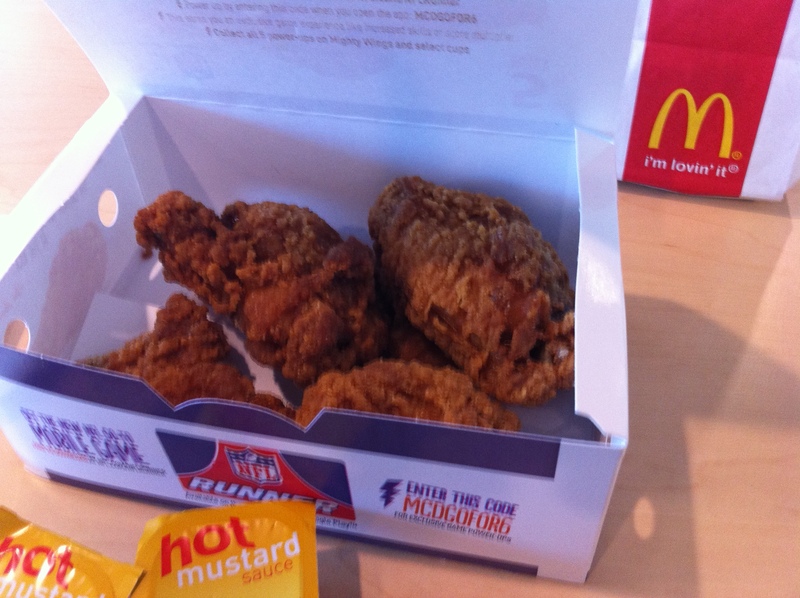 My experience ordering the Mighty Wings was typical McDonald’s. 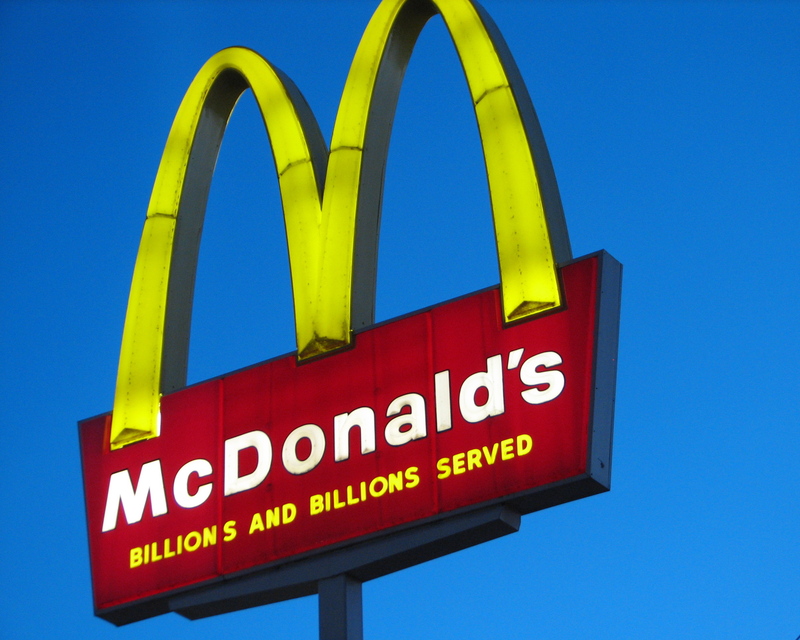 If you’ve ever ordered food at McDonald’s and found yourself greeted by the most disinterested eyes ever seen standing on that side of a cash register, you know what I mean. Fortunately, my expectations concerning ambiance and customer service were low to begin. I was informed at the counter that the hot flavored sauce wasn’t available. I was ready to give up at this point, but sheer inertia overcame me. I took the honey mustard variety instead, often my second choice of wing sauce (after exhausting all variations of Buffalo sauce, of course). The breading forms a thick, breaded crust over the entire wing from tip to tip, leaving you with a crispy but shapeless piece of chicken that you have to tinker with if you’re going to avoid chipping a tooth on the bone you can’t detect using sight alone. This much breading is basically a disqualifying factor from the start. NOT BUFFALO. But after all, who doesn’t love fried chicken? As fried chicken goes, I was satisfied. The seasoning on the wings, perfectly designed to not offend but yet remain enticingly zesty, makes them potentially the most flavorful item on the menu, in the opinion of The Wing Authority. They were plump, juicy, and filled the little box they came in. 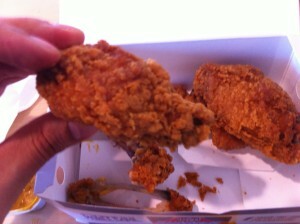 These were tasty pieces of extra crispy fried chicken, but fried chicken alone does not a Buffalo wing make. Look at these fried titans! Problem is, these wings are not tossed in sauce, wear way too much breading, and blue cheese is nowhere to be found. While these wings might compete side by side against a fried chicken food chain (more on that later), The Wing Authority is done here. NOT BUFFALO. Eating healthy? Watching your carbs? Give up fried food for Lent? BAKE THOSE WINGS! 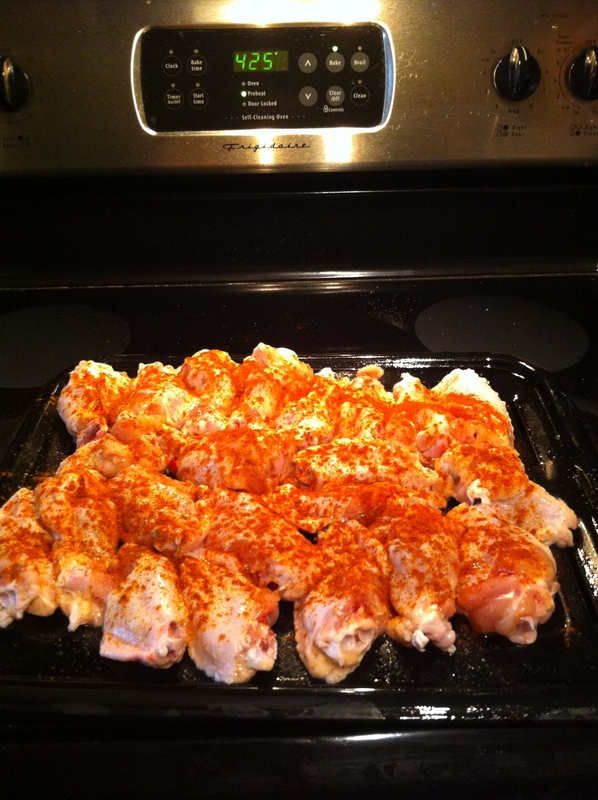 These flaps and drummettes got dusted with salt, pepper, paprika, and cayenne. Baked is healthier than fried, right? And once you drop the extra salt and the breading from fried wings you’re pretty much just eating a lean piece of meat, right? So it goes. When you think about it, there’s some truth to those statements. But baked wings aren’t exactly the lightest meal. While baked chicken falls toward the healthier end of meat options, you’re still consuming the skin in a higher quantity than if you ate, say, one chicken breast with the skin on. Nevertheless – there are those of us who are overcome by Buffalo wing cravings at least once a week, and there are those who would rather not eat fried food on a weekly basis. When the need for wings hits at full strength, baked wings are a lighter option than the breaded and fried variety of buffalo wings, so The Wing Authority says: BAKE THOSE WINGS! These are almost ready to be flipped. The basic gist is that wings need to be roasted and crisped, then flipped over to get plenty of roasting on the other side. You can’t have Buffalo wings without that distinctive crispy bite. Next, you toss them in hot sauces and something buttery, and you’re all set. Baked wings that are totally Buffalo. The most common disadvantages to baked wings are that the skin can be soggy or that the meat isn’t as juicy from overcooking. 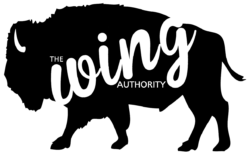 The Wing Authority will show you how to get them crispy and keep them moist. The key to successful baked, truly Buffalo wings is getting the skin crispy. This can be tricky when you consider that you also have to watch not to dry the meat out with too much heat. No worries. We’ve got the way right here. This separate batch without spices came out nicely! 2. 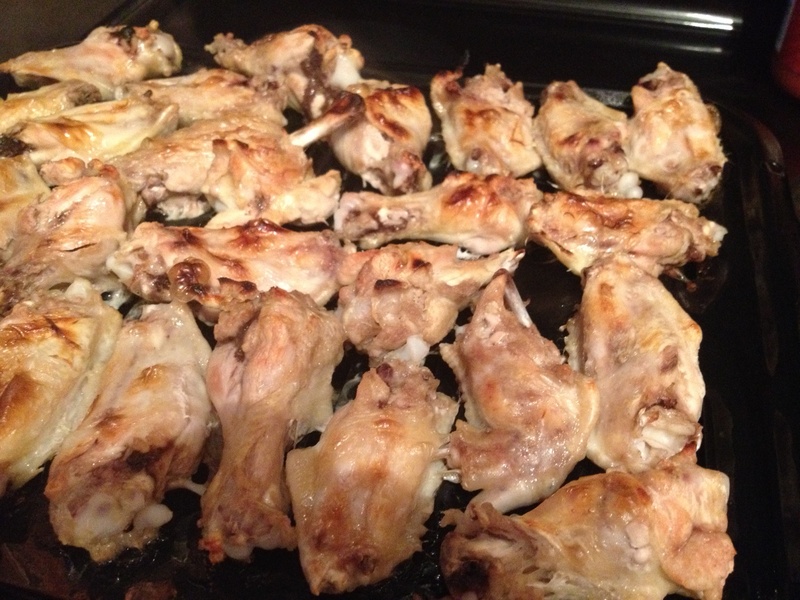 Arrange thawed, rinsed chicken wings on a broiler pan so that the heat envelops the meat. Try to turn each flapper skin-side down and to leave some room between wings, if you can. 3. Bake wings for 18-22 minutes. Look for the chicken skin to begin to brown and for the wings to tighten up and lose their “wet” look. 4. Turn up oven temp to the HIGH BROIL setting, and set the time for 5-8 minutes. 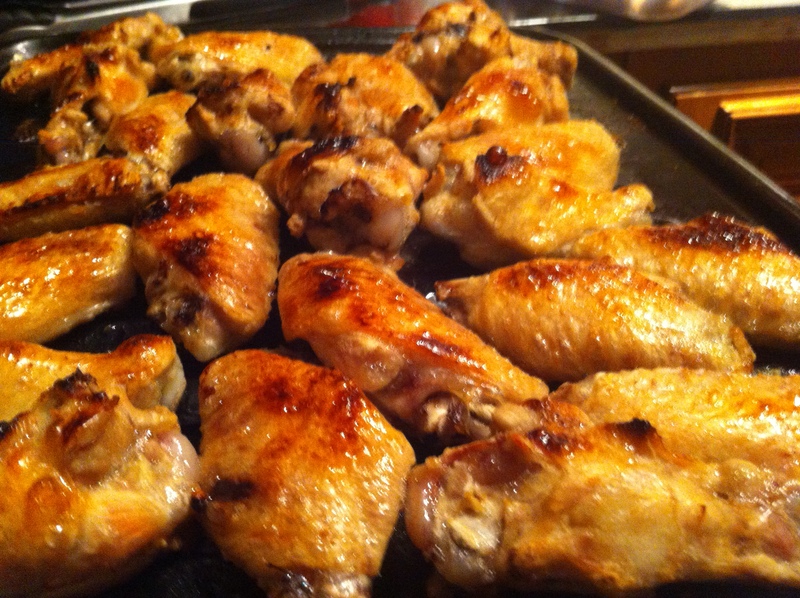 Remove the wings from the oven when the skin has browned and at least a few of the wings have small charred spots. 5. 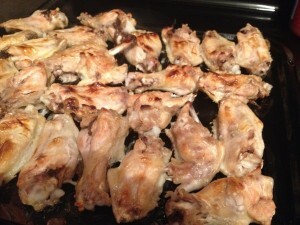 Using tongs, flip each wing on the pan to turn them over. Reduce the oven heat back to 425, and slide the pan of wings back into the oven. Set your timer for 15 minutes. This last stretch of baking time may vary depending on the number of wings and your type of oven, but what you’re looking for is that the skin browns. 6. Once the wing skin is looking brown, increase the heat up to HIGH BROIL again, and scorch the wings for about 5 minutes. Again, if you see a few of the wings start to blacken, then you’re where you want to be. The meat inside will be tender and juicy and the skin will have the familiar CRISP of classic, fried Buffalo wings. 7. Stop reading this and make some hot sauce. You’ve got wings to bake!